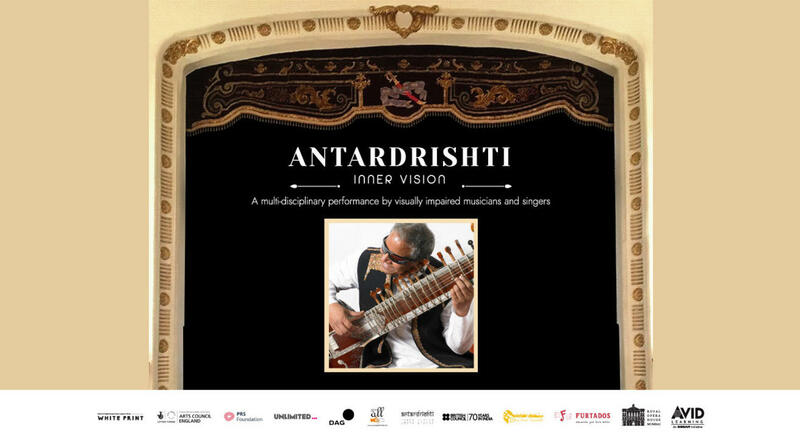 The Royal Opera House, Mumbai in collaboration with British Council and Avid Learning proudly present Antardrishti - Inner Vision, a music, dance and audio-visual extravaganza produced by London-based organisation, the Baluji Music Foundation. The project will premiere at the Queen Elizabeth Hall, Southbank Centre in September 2018 during their Unlimited festival, followed by a performance at the Norwich Arts Centre and then in India in partnership with the British Council in Delhi and Mumbai. Led by multi-instrumentalist Baluji Shrivastav OBE, who is visually impaired, the performance will feature Inner Vision Orchestra which is the UK's only blind orchestra. The programme will also feature digital artistsAddictive TV who create music you can ‘see’ as well as professional visually impaired musicians from across India including tabla/ vocals Raju Maurya, Indian flute Perumal Varudaraj, Indian violin Chiman Lal, vocalist Sayani Palit and classical Indian dancers from Delhi’s Arunima Kumar Dance Company. To dimensionalise the evening and showcase initiatives for and by the visually impaired we will feature a pop-up of Braille tactile art works created by visually impaired students curated by Siddhant Shah - DAG and a selection of Braille - tactile alphabet books in Hindi and English known as ‘Tactabet’ brought by lifestyle magazine written in braille, 'White Print'. The British Council is the UK’s international organisation for cultural relations and educational opportunities. We create friendly knowledge and understanding between the people of the UK and other countries. We do this by making a positive contribution to the UK and the countries we work with – changing lives by creating opportunities, building connections and engendering trust. We work with over 100 countries across the world in the fields of arts and culture, English language, education and civil society. Each year we reach over 20 million people face-to-face and more than 500 million people online, via broadcasts and publications. Founded in 1934, we are a UK charity governed by Royal Charter and a UK public body. 2018 marks 70 years of the British Council in India. We have been inspired by India every day of the last 70 years and want to build on the connections and impact of our work, share those stories and inspire millions of young people for the next 70 years. Avid Learning, a public programming platform and cultural arm of the Essar Group, has conducted over 900 programs and connected with more than 100,000 individuals since its inception in 2009. Driven by the belief that Learning Never Stops, AVID’s multiple formats like Workshops, Panel Discussions, Gallery Walkthroughs, and Festival Platforms create a dynamic and interactive atmosphere that stimulates intellectual and creative growth across the fields of Culture and Heritage, Literature, Art and Innovation.